The Montessori materials are a significant component of the prepared environment. Dr. Montessori believed that if children are given access to materials especially designed to support their development, they have the capacity to learn by their own actions. 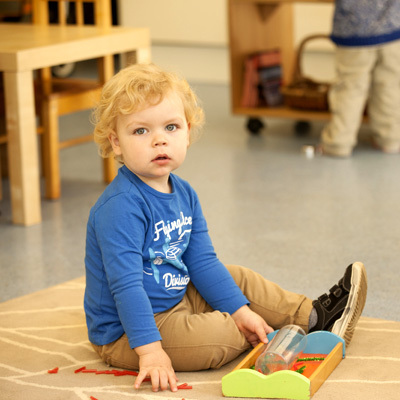 A Montessori Prepared Environment nurtures the natural excitement and curiosity of learning by offering a variety of materials to stimulate and intrigue the child. Children can hold cylinders and spheres and work with imbucare boxes to master their visual discrimination skills. The materials demonstrate understanding and serve as the base that will clarify difficult abstract concepts in all future learning. The specially constructed equipment is made from natural materials and designed through observation of the developmental needs of the child. It provides the opportunity for a child to work on tasks for extended periods of time, thus supporting the development of concentration. As the children work they are also able to gauge their performance because of the in-built “control-of-error” in many of the materials. The grading of materials provides a safe environment for children of differing abilities, both those who have learning difficulties and those who benefit from acceleration, to grow without being singled out.